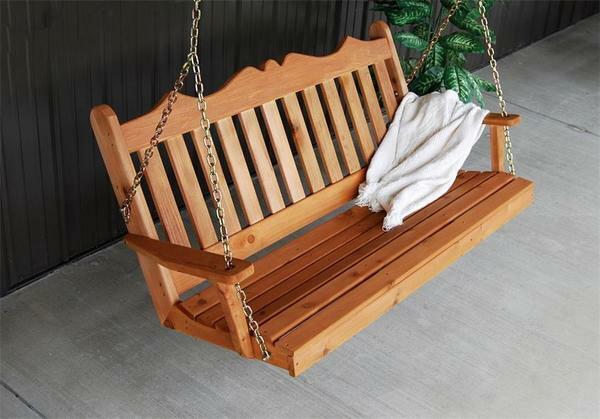 The Amish Western Red Cedar Royal English Swing is porch furniture you'll love using. Create a relaxing retreat outdoors where you can rock and relax in the comfort of this deluxe, solid wood porch swing. This timeless English garden furniture never goes out of style and is a porch swing the whole family can enjoy. Perfect for your porch, patio or set up in your lovely garden or backyard, the Cedar Royal English Swing will quickly become a family favorite. While this cedar outdoor furniture is perfect for the porch or patio, it also makes a great addition to your garden or backyard scene. Select the Amish Cedar Wood A-Frame Swing Stand to set up this gorgeous swing among your flower garden or near your rosebushes. DutchCrafters is proud to work with businesses to provide the custom furniture that best fits their needs. Choose this English Swing to greet customers at the entrance to your business. Visit our Contract Sales Page for more information. Choose from three custom lengths. We offer a 4', 5', or 6' swing. Call today with any questions, order online, or email us. Our toll-free number is 866-272-6773.